Meigs’ Marissa Noble (8) goes up for a kill attempt during the Lady Marauders’ Tri-Valley Conference Ohio Division volleyball match against River Valley on Thursday night in Rocksprings, Ohio. ROCKSPRINGS, Ohio — There was plenty of pink to start, but otherwise it was almost all Maroon and Gold. That’s because the Meigs Marauders completed a three-game sweep of the visiting River Valley Raiders on Thursday night — winning 25-5, 25-22 and 25-18 in a Tri-Valley Conference Ohio Division volleyball tilt inside a pinked-out Larry R. Morrison Gymnasium. The contest — in which the two clubs donned the traditional pink uniforms — marked the Lady Marauders’ ‘Volley for the Cure’ match, which benefits the Susan G. Komen Foundation for breast cancer research. But once the action got underway, the Lady Marauders maintained control for the majority of the affair — and gained the season sweep. Meigs also captured the initial meeting at River Valley, taking three of four close games on Sept. 12. The victory raised the Lady Marauders’ record to 9-10, and to 6-4 in the TVC Ohio. The loss left the Lady Raiders winless in the league at 0-10, part of 3-16 overall. River Valley began its season at 2-1, but lost a dozen consecutive before a victory over Ohio Valley Christian School snapped its losing streak. Since then, including Thursday’s outcome, the Raiders have dropped their last three. In the opening game, as well as the closing, Meigs jumped out to 3-0 leads. But in the first set, the Lady Marauders simply never looked back in winning 25-5. Marissa Noble served for six straight service points after Meigs got a sideout, as she recorded three aces in four serves to make it 10-1. After another sideout, Kassidy Betzing served for five straight points to make it 16-2, as the Marauders managed the final four points for the 25-5 rout. In fact, River Valley’s only points in the game were a pair of kills by Carly Gilmore, one kill apiece by Caterina Gattinara and Rachel Horner, and a service error. The second set was much more competitive, and featured five lead changes and 11 ties. The Lady Raiders led 14-10, but Breanna Lilly got a rare kill from the libero spot — and jump-started seven straight points as Meigs surged ahead 17-14. River Valley won five of the next six points, including a pair of Gilmore aces, to retake the lead at 19-18 —but the Marauders won five of the final seven points for the 25-22 triumph. The Lady Raiders, on the final of Gattinara’s three aces in the game, got as close as 23-22. In the third game, like the first, Meigs never trailed — and even staked a 16-9 advantage. The Raiders, behind seven straight points including a pair of aces by Isabella Mershon, rallied for a 16-16 tie — but the Marauders dominated from there, winning nine of the final 11 points for the 25-18 sweep. 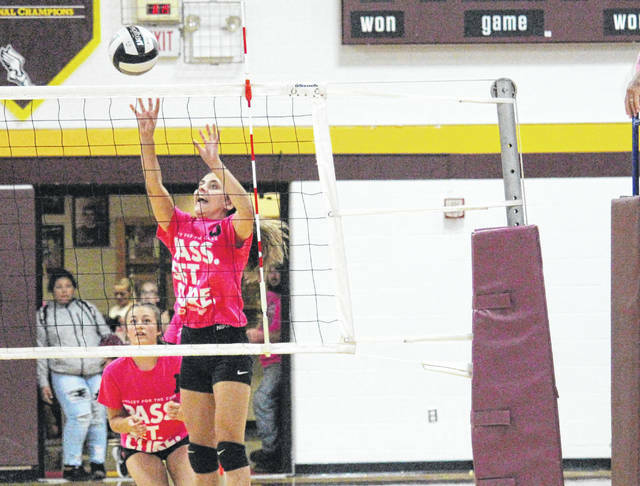 Meigs had 100-percent serving in that final game, and mounted a total of 22 kills, including seven by Betzing who also had a third-set block. Noble and Paige Denney collected four kills apiece, as setter Madison Fields finished with 13 assists. Gilmore led the Lady Raiders with eight kills and a pair of blocks, as she had half of her kills in the third game. Horner added a half-dozen kills, as River Valley ended up with 19 on 106 total attacks. The Silver and Black also served for six aces on 38 serves, and totaled 25 digs, 17 assists and four blocks. Both squads return to TVC Ohio action on Tuesday night — with River Valley visiting Vinton County and Meigs hosting Nelsonville-York.